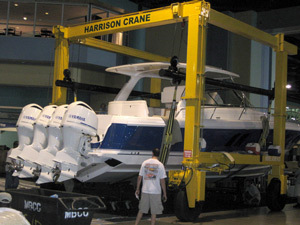 Harrison Crane can definitely assist with your intermodal and storage needs. We often transfer containers and other heavy equipment in our yard from long haul truckers who need to get back on the road to local truckers who either haul to the final destination or to the Port of Miami. We are very close to both the Port of Miami and Port Everglades in Fort Lauderdale as well as Miami International Airport. 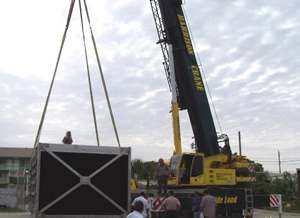 We also utilize our 25 ton ACME travelift to quickly transfer, unload, or load large items here in our yard. The travelift is perfect for transferring large boats from one trailer to another and does the job much quicker than a crane typically can. It is also ideal for transferring large tanks in the same manner. Please have a look at the specs on our travelift here. Harrison Crane also offers short term storage of large equipment (primarily HVAC related, but we have stored large turbines etc.) in our yard when immediate transfer is not possible. We will then handle loading out and trucking these items to wherever they need to go. If you are an HVAC contractor in need of short-term storage or a freight forwarder looking for assistance in moving heavy equipment either into or out of Miami, please do not hesitate to give us a call.